Greetings! We are excited to announce a new teaching conference coming this December! Many have declared that God is through with Israel. The Bible declares that God is NOT finished with His Chosen People, His Treasured Possession. Our teacher will be Jeff Gutterman. Jeff is a field representative with Ariel Ministries. He was born into an Orthodox Jewish family and has placed his faith in Messiah, Yeshua. He earned a Bachelor of Arts in Psychology from Long Island University, a Master of Science in Education from Fordham University, a Master of Theological Studies from Tyndale Theological Seminary and a Doctor of Ministry degree from Scofield Graduate School and Seminary. Jeff is a gifted teacher and you will not want to miss this all-day Friday and Saturday morning event! Below you will find the conference schedule including 4 amazing session topics. We hope to see you there! Cost and Location: The cost of this event will be $45 (includes food and conference materials) if booked by December 1st. The price will increase to $65 after this date. The event will be held at the Home Office at 11926 Radium Street, San Antonio, TX 78216. 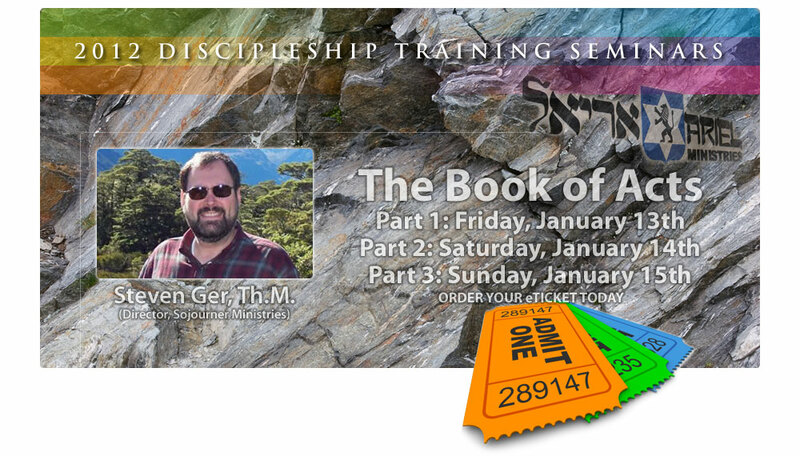 Clear your schedule and sign up for a three-day intensive seminar on the Book of Acts (January 13, 14, and 15)! Click the image below to reserve your spot as seating is limited. The 11th branch of Iran’s Gilan Provincial Court has determined that Nadarkhani has Islamic ancestry and therefore must recant his faith in Jesus Christ, or face execution. Read the full story here in the Washington Post.